Konsert DiRaja (The Royal Concert), one of the highlights of UKM’s 40th anniversary celebrations, which was held at the Dewan Canselor Tun Abdul Razak (DECTAR) on 22nd May, was a huge success. The Yang di-Pertuan Besar of Negeri Sembilan, His Royal Highness Tuanku Muhriz Ibni Almarhum Tuanku Munawir, who is also UKM’s Chancellor and Her Royal Highness Tunku Ampuan Besar, Tuanku Aishah Rohani Binti Almarhum Tengku Besar Mahmud graced the night. The 60-piece Orkestra UKM, the pride of UKM, gave a powerful show in front of 300 invited guests including His Royal Highness the Sultan of Perak, Sultan Azlan Muhibbuddin Shah Ibni Almarhum Sultan Izzuddin Shah, and Her Royal Highness The Raja Permaisuri, Tuanku Bainun, and Her Highness, Raja Zarith Sofiah Binti Almarhum Sultan Idris Shah, consort of the Sultan of Johore. Encik Mohamad Adzan Mohamad Fadzil and Dato’ Johari Salleh were conductors of the orchestra, featuring Aishah and Roy. 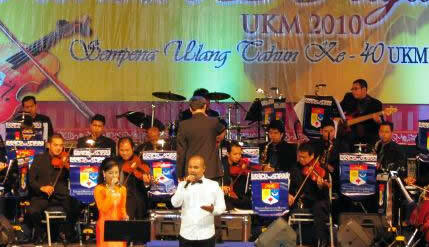 Orkestra UKM, which was formed in 2005, held its last big performance at the installation of the Yang di-Pertuan Besar of Negeri Sembilan early this year. UKM Minister mentor, Dato’ Sri Shahrizat Abdul Jalil, The Chairman of UKM Board of Directors, Tan Sri Dato’ Paduka Dr Mazlan Ahmad and Vice Chancellor, Prof Tan Sri Dato’ Dr Sharifah Hapsah Syed Hassan Shahabuddin and senior administrative officials also attended the show.